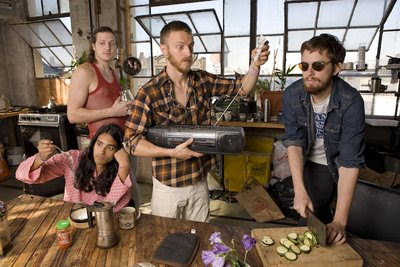 Yeasayer are to be playing their second show in Los Angeles, CA. "Seeing we were not invited to partake in the rock'n'roll Thunderdome called Coachella we have decided to set up our own festivities in the heart of Los Angeles. This will be Yeasayer's second Los Angeles show, but one of our many w/ buds No Age. We are very excited." "...There will be libations served. If you aren't going to Coachella please come out." Incidentally, I now have the video of the Yeasayer performance from Later with Jools Holland last week.